At the time, he was almost done with his Master’s Degree in Mechanical Engineering, all his school was paid for, he’s brilliant, he had achieved great things in his life—I just assumed that he was like me when it came to setting goals. But it turns out, he’s actually not one who likes to sit down and map out what he’s going to do. He’s what I call a reluctant goal setter. I realized I needed to approach it differently. I backed off a lot and decided that the way to approach goal-setting with him was to bring it up in more casual conversations, instead of a formal sit-down. As time has passed, I’ve toned down and he’s stepped up. He’s seen how helpful it is for me to have a conversation and write goals down if I want to accomplish something, like losing weight or starting a business, and I’ve realized that I have to tone it down a bit. A better approach for him is shorter, more frequent conversations about what kind of family we want, what is important to us, what we want our house to look like, and what qualities and traits we hope our kids have when they leave home. 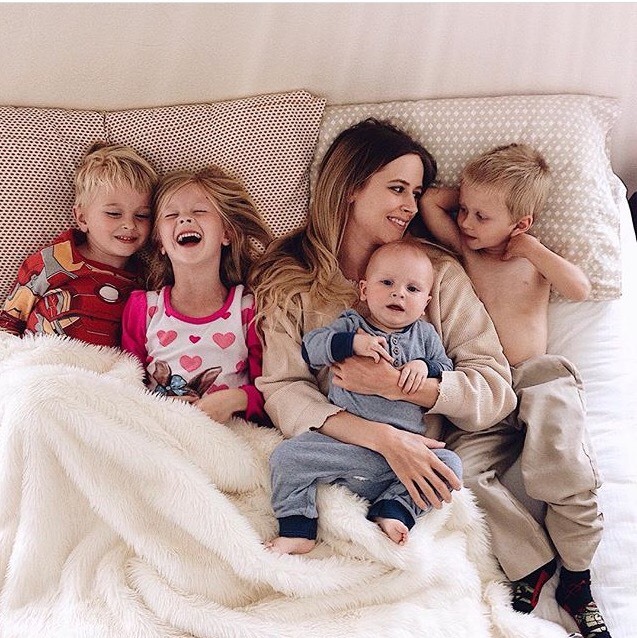 With both my husband and my five children, I’ve realized it’s not worth forcing my family into something. If they feel forced to do it, they’re not really going to go along with it. I help my kids set goals at the beginning of the year, by printing out a goal-setting sheet for them and encouraging them to fill them out. (We use a printout from Handmade in 30 Days.) But then I back off and let them fill them out themselves. I really let them decide what they want to do. I’ve realized that in order for goals to work you have to feel excited about them yourself. Personally, I am as gung-ho about goal-setting as ever. I’m always reading a book about personal development. Every year I go through a course called Michael Hyatt’s best year ever. Within that he has these different areas of your life, including parenting and marriage. I like it because even though I can’t control what my spouse and kids do (nor do I want to), I can control what my own goals are in those areas. I learned a lot about how to approach my family life from reading the book “The Seven Habits of Highly Effective People” by Stephen R. Covey. One of his tips is to “Begin with the end in mind”: to think about the direction, purpose, and overall feeling you want for your family. One thing that helped my family start to define our direction and purpose actually happened by accident. My daughter really loves to draw, and several years ago and she drew on this piece of paper, “I am a Davis.” I loved it so much that she’s now working on a bigger version of it to put in our entryway. Since putting this sign up, we talk a lot about what that means to be a Davis. When the kids say, “That’s too hard for me,” I say, “No it’s not too hard, because you’re a Davis. You can do hard things." It doesn’t have to be perfect, just do your best.” When tricky things come up, even in my own mind and I don’t think I can do something, I think back to the sign. I’m a Davis! The other thing this sign reminds me is that we are unique, and we get to decide what is important to us. With social media, we can see what all sorts of other families are doing. It’s easy to wonder if we should be doing those things too. It might be a huge family vacation that isn’t really an option for us right now, or a beautifully decorated house. But we just have to remember we’re all doing the best we can. Some moms do so much parenting on their own, and they see what other families are doing and don’t realize how much help other moms have from their spouses. We just have to remember we’re all doing the best we can and be confident about our choices and priorities. In our home our main decoration is books. I’m not a fancy decorator, but I’ve always included things that are important to me. In our front room we’ve never had a TV sitting out, we’ve always used it like an appliance, just bringing it out when we want to use it. But we do have books in our main living areas—lots of books, lots of puzzles, and lots of games. We have a rolling library cart in our family room, and that’s where I keep all the library books. The library has always been a big part of our family culture. Now that they’re older some of my kids don’t always make it there with me and the younger kids, but I still always get them books. I’ve never given my kids a limit to the number of library books they can get. I bring this big yellow crate to pick up books and the librarians always think I homeschool. I just like to keep the library books fresh, to encourage my kids to read. One thing my husband and I do every day ask our kids if they helped anyone out today. We talk a lot about serving other people. This is something that was important in the family culture I grew up in as well. We were always finding ways we could help neighbors and our community. Last year, our community held a good-neighbor Saturday, and we all went out and did yard work for those who couldn’t do it for themselves. They had a breakfast and passed out t-shirts and then assigned each family a house to help at. My kids weren’t super excited about the hard work ahead, but then we got to the house and knocked on the door. An elderly man came to the door and said, “I’ll show you where the tools, but I can’t stay out very long because I can’t leave my wife alone. She’s terminally ill.” He stepped out of the house for five minutes and had to go back inside to take care of his wife. This completely changed my kids’ perspective. I won’t say they loved every minute of it, but it helped that they knew we were helping an actual person. We pulled weeds for three to four hours. In addition to the good feeling of helping this man, we took them out for donuts afterwards. I learned that from my dad—he always paired something fun with service. Another way my husband and I keep the big picture in mind is to sit down together and make sure our calendar and our budget reflect our priorities. We want to be active and serve and help people out, but we can’t do it all. Sometimes you have to say no to things, to make room for other, more important things. For example, a couple of years ago, my husband was part of a layoff, so we wanted to make a really deliberate decision about where we wanted to live. We had always talked about moving back to the mountains because we really missed spending time outdoors. That was a little harder in the Midwest because there weren’t mountains and it was really humid. We ended up with a job offer in Chicago and one in Oregon. We gathered our kids around us and talked to them about the options. Moving to Oregon would mean downsizing by about half, because the cost of living is higher, but we’d be close to the mountains, which was where we’d always wanted to be. We wanted the kids to see that we had a choice, and to teach them to weigh the different options. Ultimately, we chose Oregon, which was a big transition, with many more tough decisions. But we made those decisions as a family, with our values in mind. Now learning to prioritize together is part of our family culture. A smaller example of this principle was when our oldest daughter decided she didn’t want to take piano lessons any more. Four of our children were in piano at the same time and it was getting really expensive with four kids taking piano lessons. I noticed that when she has free time, she doesn’t sit down at the piano, whereas a few of my other kids do. She loves dance and art, and that’s how she spends most of her free time. We just had to decide that our calendar wasn’t reflecting what was important to her, even though it was still important to me. She quit piano, but she knows how to read music, which was our main goal. Sometimes I look at other families who take big vacations in the middle of January, and I wonder if maybe that’s how we should be spending our money. But we moved to a more expensive place, our kids are getting older and are involved in more activities, and I made a choice to start a business, which all costs money. So that’s where we choose to spend our money right now. But travel is still in our long-term plan. A long time ago we decided we wanted to take our kids on a special trip when they turned 16, because it’s expensive to travel with our whole big family. So that’s something we’re saving up for, which means we have to say no to other things. But when I look at my big picture, I can see that we’ll get there. My kids are already talking about where they want to go. It’s good to give them something to look forward to and to think about the future. We live in a world that’s so instantaneous, that it’s good to teach them how to wait for things. It’s a matter of prioritizing and figuring out what is important to you. When my kids were little, we went to pick strawberries together and on the drive back home we talked about what we wanted to do that summer. That began our family bucket list tradition. Now that the kids are older, we always try to make a summer bucket list and a Christmas bucket list together. In keeping with our original strawberry picking tradition, we often talk about this in the car when we travel for Thanksgiving or other spring break. Car rides are actually excellent times for family meetings, since you’re all together and you have a captive audience. I love talking through our Christmas and summer traditions because it helps me realize what activities are really important for my kids. I ask them what they don’t want to miss for each season, and what they don’t really care about any more. As our family has grown and changed, we have abandoned some traditions and kept others. The key is to ask everyone. You might think something is important and that your kids really love it, but find out that they don’t love it at all. Our style of parenting is to discuss decisions together and get input from everyone. As parents it’s very easy to get caught up in our own agenda, but I try really hard to let the kids be part of the solution, even if we think their idea isn’t going to work. If for example, one of the kids thinks of a certain consequence for a behavior, and I don’t think it’ll work, I still try it and see how it goes. Then we get back together and talk about how it worked and come up with other ideas. Overall, I like to think of my job as leadership rather than parenting. Parenting sounds like I’m pushing or coercing my kids. But if we think of ourselves as leaders we’re trying to inspire and lead by example. Andrea Davis grew up in the heart of the Grand Tetons, so it's no surprise that she loves anything outdoors—biking, swimming, hiking, horse back riding, and her SUP. She has a B.A. in secondary education, and her teaching experience ranges from teaching preschool swimming lessons to college-level Spanish. However, her greatest learning has come from her daily work as a stay-at-home mom of five children. Andrea considers her husband, Tyler, the best co-captain she could ask for. Their motto has always been "Go Team!" Andrea is the creator of Better Screen Time, a great resource for positive family screen time strategies. She also created an Instagram and FaceBook account called Do a Lot With a Little @do.a.lot.with.a.little, where she talks about creating great things with simple means.